Haunted 4 Life is a very nice front yard display located in Lansing, Illinois, right across the street from another fun yard display called Haunted Hell. We discovered this one a couple of years ago and have seen it grow bit by bit over the past couple of years. Based on a haunted house/cemetery theme, Haunted 4 Life features a large archway with stone pillars on either side, distressed to make it look old and decayed. 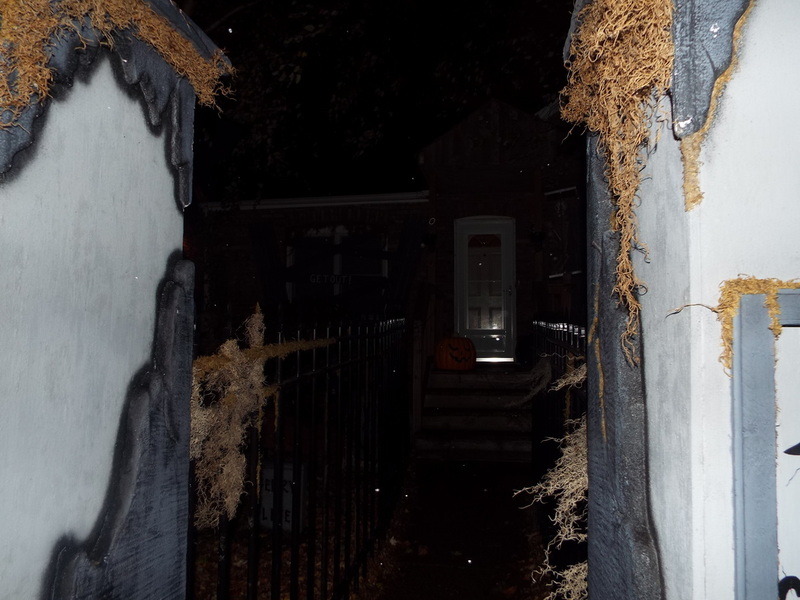 The archway serves as the focal point for a fence that surrounds the front yard and helps keep the creatures inside. 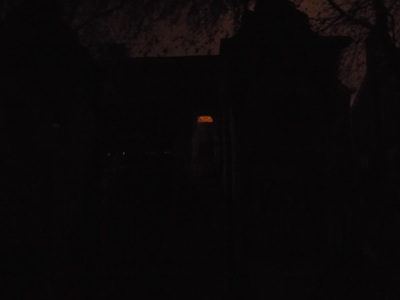 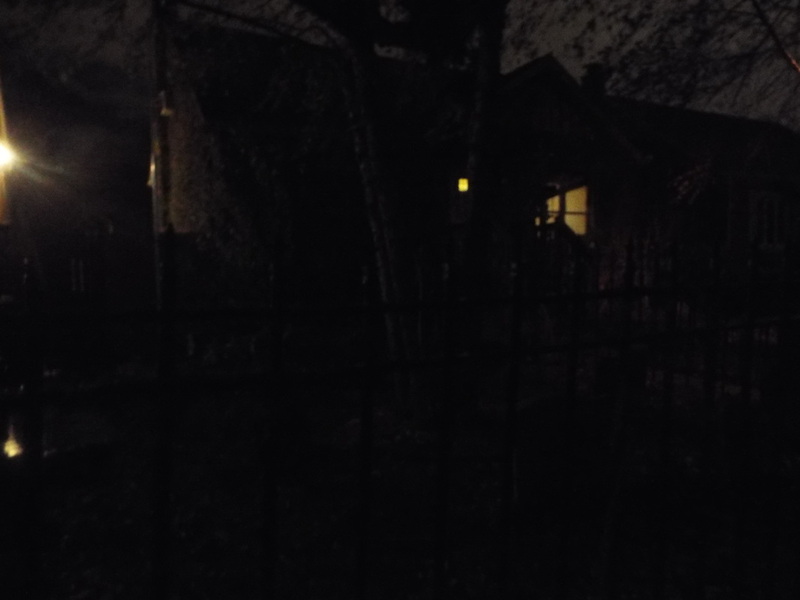 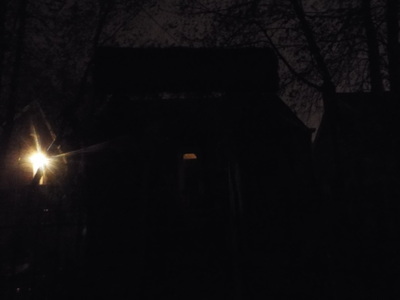 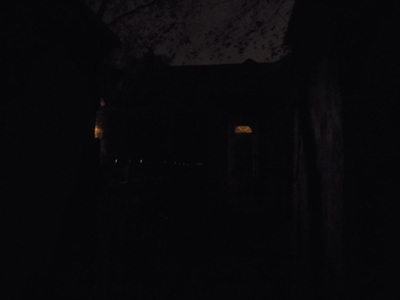 The house itself is boarded up to make it look abandoned, except for one window, which plays various silhouetted scenes across it, including a man getting killed by skeletal beings. 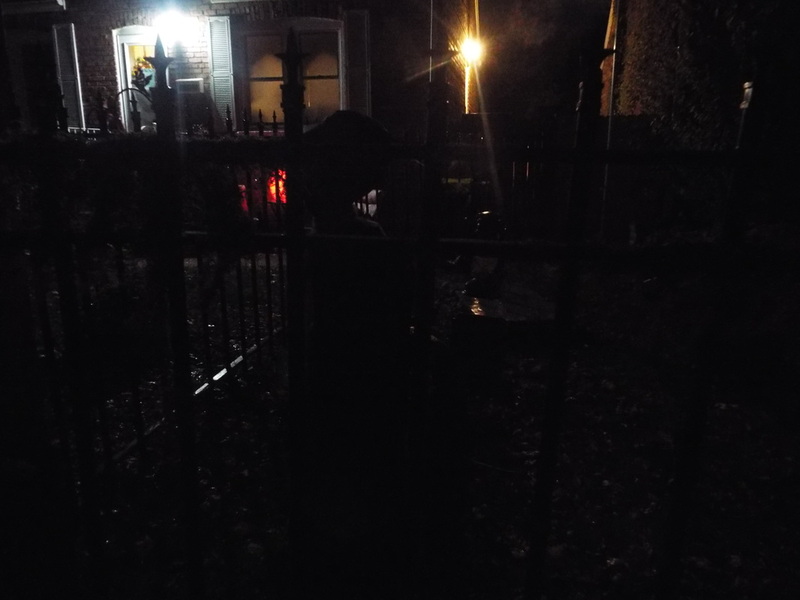 At first glance it looks quite real, and can be a bit unnerving when approaching the house. 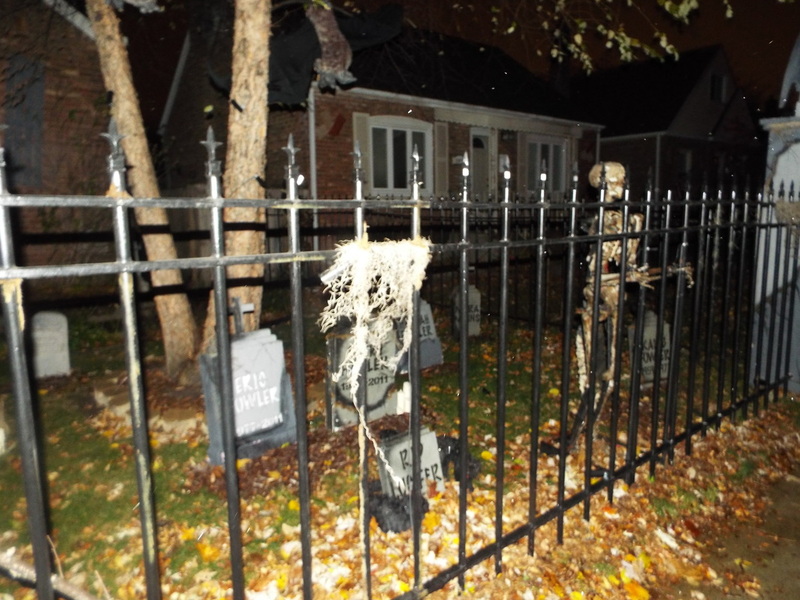 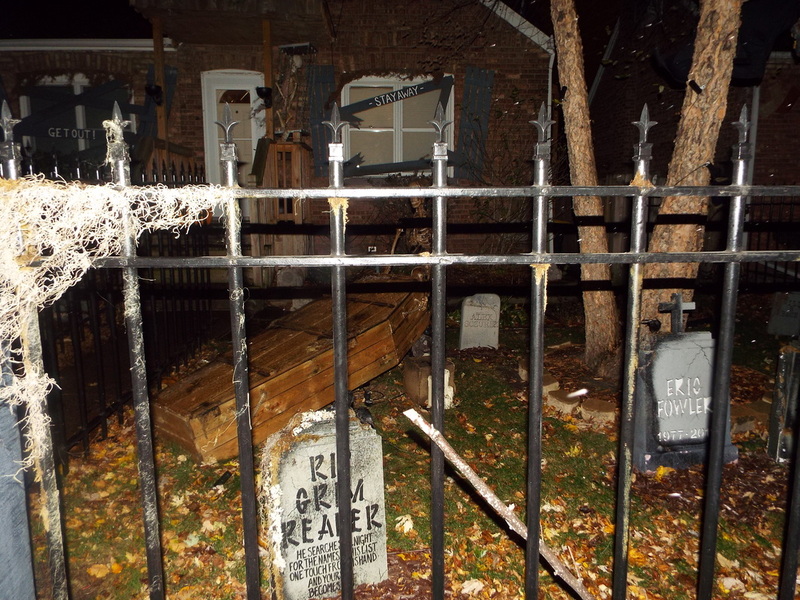 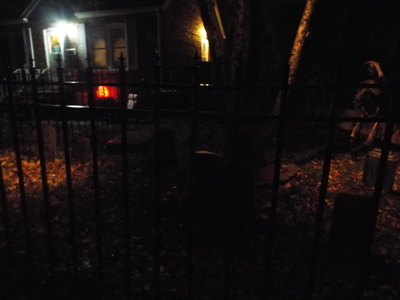 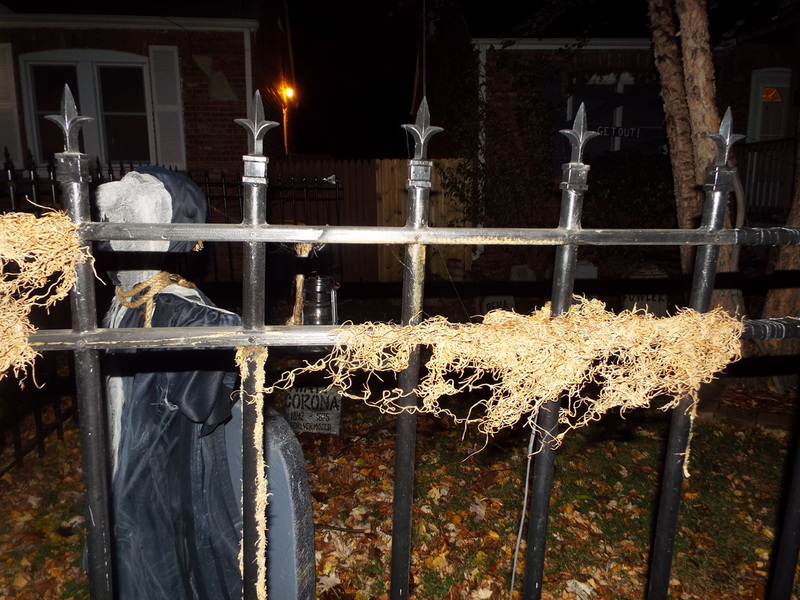 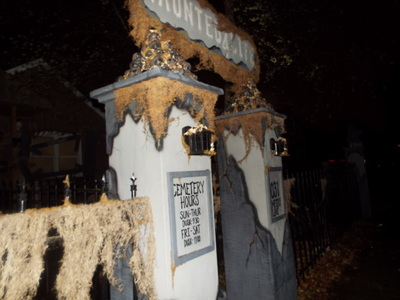 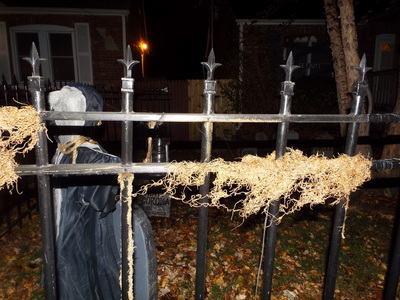 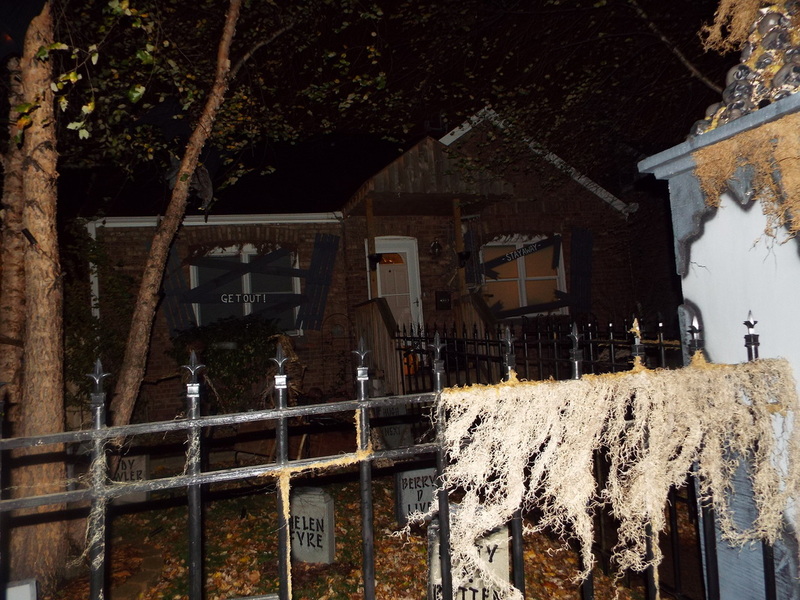 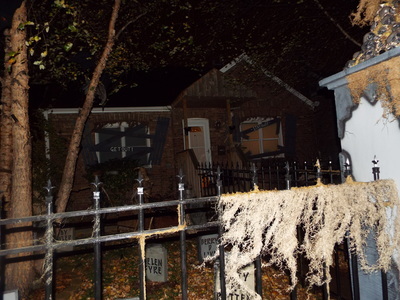 On the front lawn are tombstones, along with moving skeleton props, including one that rattles the bars of the fence as he struggles to get out. 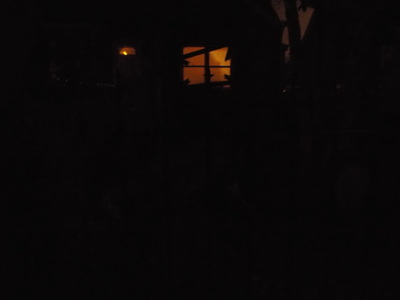 All of this is complemented by some nice lighting effects, including artificial lightning and thunder. 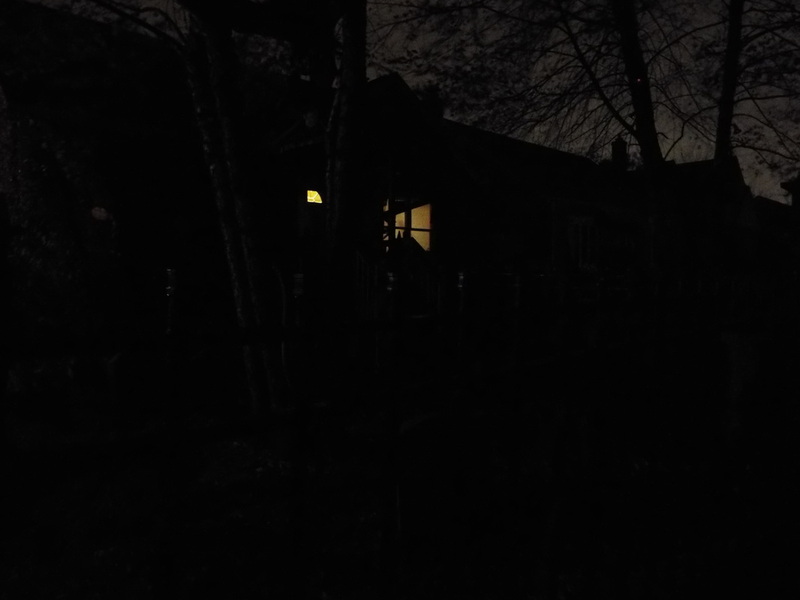 It's all done very well, and reminds us of old cartoons or films that show a nice, suburban block of homes on a sunny day, with that one old, creepy house that happens to have a black cloud over it. Unfortunately, our 2014 visit happened to be on Halloween night, when it was about 30 degrees and snowing! Thus, the display was not fully lit as it usually is, and the terrible weather forced us to only take a cursory glance. 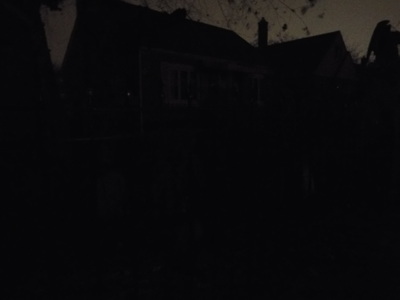 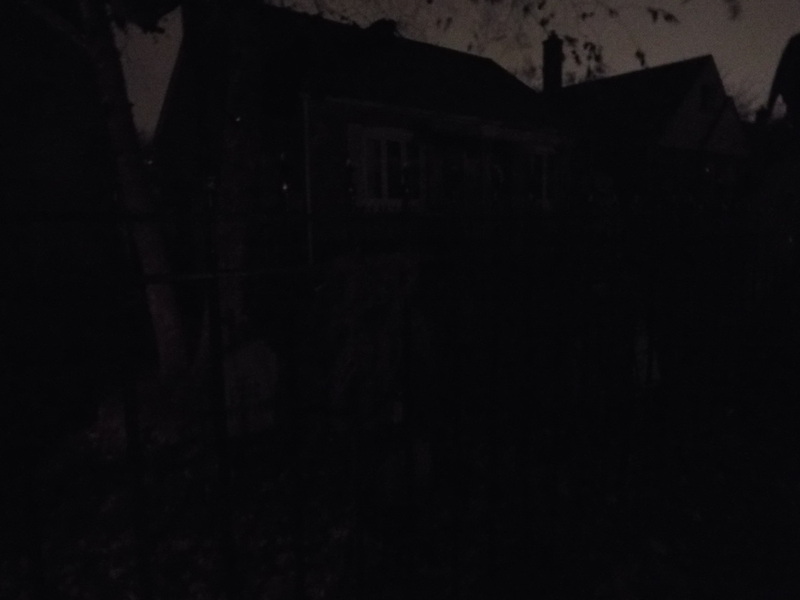 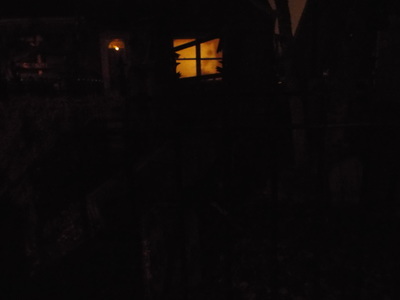 However, the darkness did make for some nice imagery. 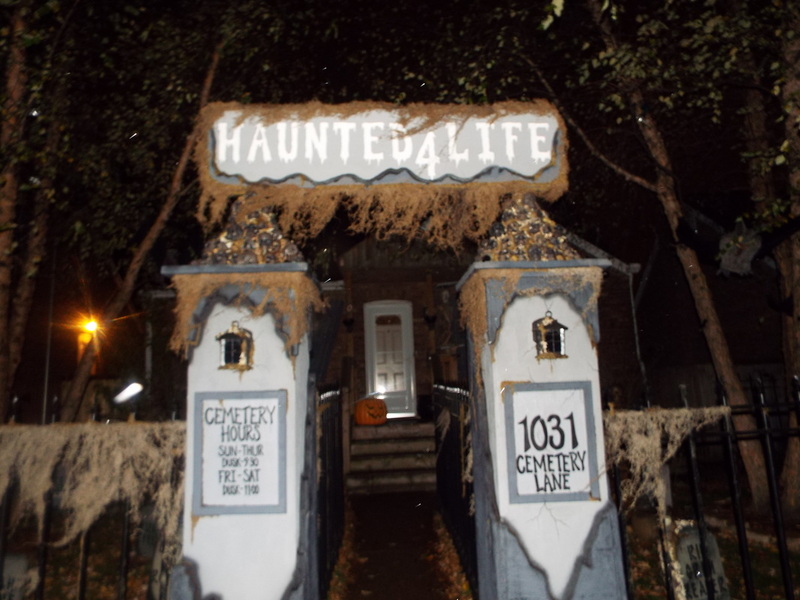 If you're in the south suburbs, check out Haunted 4 Life - it's clever and creative, and very evocative, especially on cold, windy nights!